AN usually appears slowly and doesn't cause any symptoms other than skin changes. Sometimes, the lips, palms, soles of the feet, or other areas are affected. These symptoms are more common in people with cancer. Your health care provider can usually diagnose AN by looking at your skin. A skin biopsy may be needed in rare cases. No treatment is needed, as AN only causes a change in skin color. If the condition is affecting your appearance, using moisturizers containing ammonium lactate, tretinoin, or hydroquinone can help lighten the skin. Your provider may also suggest laser treatment. It is important, however, to treat any underlying medical problem that may be causing these skin changes. When AN is related to obesity, losing weight often improves the condition. AN often disappears if the cause can be found and treated. Call your provider if you develop areas of thick, dark, velvety skin. 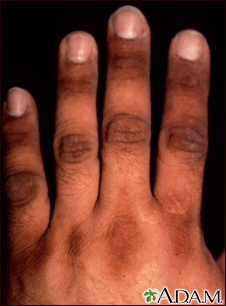 This photograph demonstrates the hyperpigmented, brownish, velvety lesions of acanthosis nigricans. This skin condition may occur in skin folds such as the axilla (armpit - pictured here), neck, and other areas. In adults, it may be associated with hormonal problems, internal malignancy, obesity, and drugs.